Defending the environment is central to everything we do. Policies we’ve influenced in Milton Keynes always have care about the environment at their heart, and MK is a greener city for the things our party has done. What we’ve not done is talked about our achievements, because we assume everyone else would behave in the same way. I’m writing this as a relative newcomer to the Milton Keynes Liberal Democrats, having become involved in the party a few years ago. Those in our party talk about the environment and take action all the time, even if we don’t shout about it. Recently when I started asking our councillors about our green policies and what our party has achieved they gave a long list of successes to be proud of over the years, both in and out of power in the council. The list would be too long to give here, however it is clear that they have promoted green policy at every level at every opportunity in Milton Keynes without realising how much they have done, because defending the environment for future generations seems as normal to them as breathing. When measuring achievements on the environment recycling is one of the ‘easiest’ things councils talk about, and the Liberal Democrats have a good record, including harder choices for long term good. Before 2002 Milton Keynes had been run by other parties for many years, green policy had been neglected and recycling rates in the borough were lingering at 11%. In the elections in 2002 when Liberal Democrats took majority control on Milton Keynes that changed, and in the following 9 years that our councillors ran MK recycling rates were increased to 55%. The changes were by making recycling systems better, increasing the range of items that could be recycled, and engaging residents so that systems were easy to use and more people did recycle. One of those changes was the introduction of green bins in MK. Initially for garden waste and charged for, with the Lib Dems later making them free allowing kitchen waste and introduced kitchen caddies, reducing the food waste which went to landfill by making it easier for residents to do the right thing. The Liberal Democrat successes have not been continued by the Tory and Labour councillors which have run MK council since 2011, and recycling rates have not improved much since then 2011. 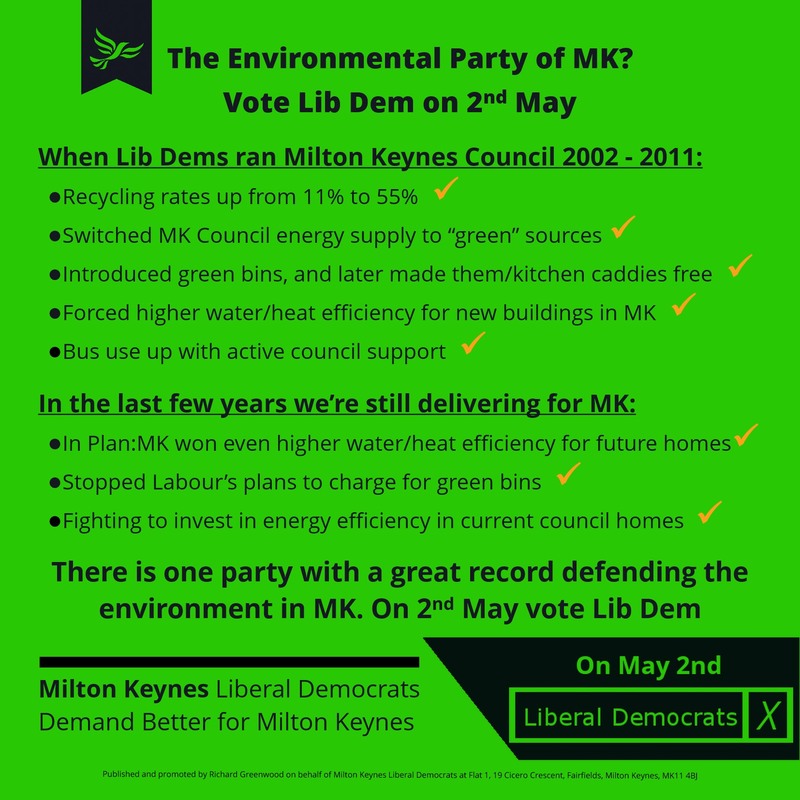 While Lib Dems included a defence of the environment in all policy areas automatically the other parties have been letting Milton Keynes down. A choice many councils made which is now causing them problems was deciding to recycle ‘on the cheap’, sending their recycling across the world to China and elsewhere because the cost was lower. This often involved low standards and in the last few years we’ve been finding out that much of this ‘recycling’ wasn’t reprocessed but was just buried or dumped. Milton Keynes doesn’t have that problem because over a decade ago our Lib Dem councillors ensured that recycling from Milton Keynes was sent for processing in the UK, ensuring it was properly tracked and disposed of. This decision which seemed more expensive in the short term is now confirmed as the right thing to do. Now the percentage of waste recycled rather than sent to landfill in Milton Keynes is set to increase again, and it is due to the Waste Recovery Park planned under the last Liberal Democrat administration in MK. The plant in Wolverton will take black sack waste and separate out materials which can be reused or recycled, some that will need to be buried, and some which will be heat treated. However unlike many similar plants elsewhere the heat treatment will be fully contained: no waste will be put out into the environment. Recently when the Labour led council considered introducing charges for green bins our councillors produced evidence to show that the plan to charge wouldn’t work. While the Tories used it as an opportunity to attack others, Lib Dem councillors provided Labour with evidence to show it is better to keep green bins free without turning the issue into a political football. Any building built in Milton Keynes in the last 10 years has lower utility bills because of changes made when Liberal Democrats were running the council, and now future houses will have even higher standards thanks to the influence our councillors have in the council. When Liberal Democrats took over the council back in 2002 our councillors felt the standards for new housing left in place by previous parties were not good enough, so under a policy known as “D4” changed the rules to ensure developers needed to meet higher levels of water and energy efficiency for any new buildings, and those moving into recently built houses benefit along with the environment. Our councillors continue to demand better, and with improving systems and need to reduce the impact on Milton Keynes on the global environment have introduced even higher standards. The local plan called Plan:MK which outlines the growth of Milton Keynes until the early 2030s has had active support from Liberal Democrat councillors who have insisted on making it the best plan which can be achieved, including delivering higher standards for our next generation of housing in MK. While our current generation of buildings have higher standards thanks to Lib Dem councillors in MK, the next advance in standards will again be down to pressure from our council group. We need to improve our current housing too, which is why one of our manifesto commitments is to invest in existing council housing in MK to bring them up to the ‘A energy efficiency rating’ required for new homes, which will both reduce bills for those in social housing in MK while defending the environment. While the council can directly invest in council homes we want it to support change in privately owned homes, working with private landlords and home owners including giving information about grants available to bring their properties up to a good standard. Public transport should provide people with a good service, a real choice about how they travel, and as far as possible be a real alternative to the car. For all of the good things about Milton Keynes the transport system is something which hasn’t worked well, with so many people reliant on the car. Giving people a real choice is why when the Liberal Democrats ran the council between 2002 and 2011 investment in buses was increased, and bus use was going up, with many people choosing to take the bus over having a car. Since 2011 the other parties have not kept up the same push for good bus services in MK to meet people’s needs. Many have given up on buses leading to a fall in use, with many people now forced to use the car even when their families struggle to afford it – choices have been taken away. While we are calling for more support for bus routes across MK we need a better solution in the long term. Liberal Democrats support the proposal to develop a ‘bullet bus’ network (tube-train style fast electric buses) with separated bus routes across MK, which allow for much faster buses. New stations for the network would provide hubs for more regular buses which would bring regular routes closer to people’s homes. We need to give people choices. New technology needs to play a part where possible. Liberal Democrats have supported the roll out of more charging points for electric cars, and are supportive of innovative new solutions which will increase people’s choices while helping reduce our impact on the environment. Buses aren’t the only sort of environmentally friendly transport of course. The Santander cycle scheme, brought in by the Lib Dems, has offered people cheap use of a bike for years. Now that’s being extended by the new Lime Bikes (electric bikes) – powered, like MK’s streetlights, schools and council buildings, by green electricity, again brought in under the Lib Dems. Although a long article, what I’ve covered here are just a few of the points I’ve picked up from Liberal Democrat councillors. While some others shout about defending the environment to get attention and don’t deliver when they have the chance, and some have high ideals and talk about these issues while never having the opportunity to deliver, our Liberal Democrat councillors have continued to work for the environment in Milton Keynes year after year. Our Lib Dem councillors don’t jump on bandwagons, even though some others do, they just do the hard graft, treating the defence of the environment as part of the day job, just something to deliver to help leave the world a better place than they found it. I am proud of the achievements our councillors have made and the goals continue to fight for on the environment. It frustrates me that they don’t shout about it more, so I’ll be doing my best to do it on their behalf. When Milton Keynes becomes the greenest city in the UK a large part of the achievement will be down to the Liberal Democrat councillors in this borough, and I’m proud of them.